Being fluffy is its own reward. Fun and creativity don’t need representing. What is this, a religion? But if a spotlight happens, it could be for hard work to help others, a lucky chance, or having the right dance moves at the right time. Chasing attention might not be necessary, but it’s nice to show how cool this group is because that helps make it cooler. So here’s why the fandom is great in 2018. Part 1 had good media: CNN’s This Is Life with Lisa Ling, Sonicfox at The Game Awards in Los Angeles, and Bucktown Tiger on Jeopardy. For Part 2 here’s conventions, charity, art, celebrities, awards, spending, and more. Midwest FurFest got the first five-figure furry con attendance! It took 29 years since ConFurence 0 to match the biggest WorldCon (started in 1939, that’s perhaps one of the longest running nerd events, where they hand out fancy awards like the Hugos). Now we’re giving Science Fiction fandom a run for its money. It’s not on Comic Con level and may never be (…good?) but that’s millions of dollars of support to build and share the wealth. And furry is still grassroots with little outside investment and high DIY power. Super organizer MikeFolf/Canis Vulpes got in touch to share his project of herding an airplane full of furries all the way to Midwest Furfest, taking the good vibes of the con much farther than one city. If you want to go, don’t sleep on this, the seats are filling fast! FurFlight is a series of group flights on existing commercial aircraft that extends the convention experience to the journey. That reduces stress of travel there, and eliminates PCD on return, with a lot of friends along for the trip. If they're traveling by plane does that make them a flying carpet? VICE looks back on the Midwest Furfest attack, earning kudos for thoughtful journalism. The Midwest Furfest attack was perhaps the biggest spotlight moment for how furries and the media look at each other. The media didn’t come out looking so great. It was strange when a bunch of silly misfits kept the higher dignity. A new article in VICE (2/11/16) breaks through that recursive mirror. It’s a refreshingly direct look back, engaging us personally with no giggling about the misfortune of strangers. It leaves outsider baggage at the door, while reminding us where it is. The attack is unsolved, but the lack of conclusion doesn’t matter. It’s about recognizing how impactful the story is. CSI Fur Fest: The Unsolved Case of the Gas Attack at a Furry Convention – by Jennifer Swann. 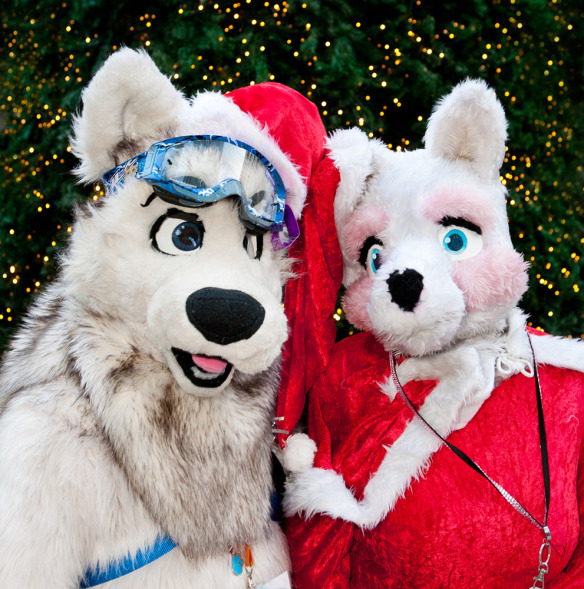 The International Business Times has tons of great fursuit photos. You may find a few more in a slideshow from the same Reuters photographer. Enjoy a con video from Vox Fox and a music video from Kiba Wolf. Fred Patten’s birthday was December 11 – Happy 75th, Fred! “Accidental Guests of the Midwest Fur Fest” – outsider appreciation gets viral views. This personal blog post got lots of love. The Healthy Not Nuts blog covers a husband and wife’s thoughts on recipes, diet, health and photography. It’s lovely when Furries add spice to the mundane! “…how can you not love these creatures that look so cute, cuddly and happy all of the time?” The post earned 267 comments. The writer shared an appreciation letter for the post, where he mentioned getting over 20,000 views. Furnation was one of the first visible Web presences for Furry fandom. It helped many to discover their fursonas in the 1990’s. Reddit calls it “the end of an era.” Flayrah gave it a feature under it’s tag for collected coverage. Social network Furrtrax made a generous offer of free hosting to keep it online. I tried helping, but got the feeling that Furnation’s admin was too burnt out with health problems to devote an ounce of effort for community moderation. I also assume the build of the site might be antiquated and burdensome (perhaps technical, or with copyright for content built by individuals.) It’s influence lives on in places like FurPlanet (formed from Furnation Magazine), one of the 3 main Furry publishers. Submitted by Fred Patten, Furry’s favorite historian and reviewer – with pawesome assistance from Kiwi Tiger. “From stories about being abandoned in the heart of civilization to stories about forced abandonment for the sake of science to how abandoned places affect the mind; the stories in this anthology cover a large range of genres and types of abandoned places. “Empathy” by Rechan doesn’t say so, but it is obviously inspired by the Kitty Genovese incident in 1964. Morty, an old man, falls on an icy sidewalk during winter and breaks his hip. He calls for help, but everyone who passes just ignores him – except the hungry rats in the garbage. The talking rat that taunts the dying Morty is what makes this a furry story. Nice but too slight. Headlines, links and little stories to make your tail wag. Story tips are always welcome. A Furry Merry Christmas To One and All – from Tom Broadbent, documentary photographer.